Have you planned that fall vegetable garden yet? The summer months are getting oh so much closer to the end. While the heat and humidity may not support that claim, the fact is, time is moving forward and eventually the summer vegetable gardening season will come to a close. That does not mean though that your gardening is over for the year. The use of a cold frame will still yield plenty of crops such as lettuce, spinach, kale, beets and chard well after Jack Frost nips at your nose. Now is the perfect time to start planning that fall garden. Your mind is already on gardening with all of those tomatoes and cucumbers you are growing (or trying to grow), so get that pencil and paper out and start charting your course for the extended cooler weather season. What I like to do is list the items that I am going to focus in on for the fall. Normally my inventory includes those items I mentioned previously plus a few more. I change it up from year to year just as I would for my spring/summer garden. A lot of your leafy vegetables are excellent choices for the cooler months. I even read in an issue of Mother Earth News Magazine how a light touch of frost on your kale will enhance its flavor. I have not tried that myself, but if you do, or have, please let me know how it turned out for you. A couple of good choices for quick growth include radish and turnips. They mature quickly and have great flavors. 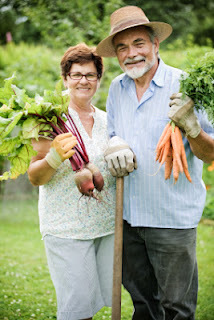 Keep an eye on some of those veggies you were meaning to start for the fall as we are at that point in time where you better get them started because they will need time to grow. Examples include rutabaga and spaghetti squash. If you use cold frames, the temperature won’t be as big an issue as sunlight will be, so get them started right away. If you are like me, chances are you will be using the same garden areas in the fall that you used in the summer. The soil is going to be depleted with many nutrients, which does not necessarily mean you won’t be able to grow anything, it just means the growth could be stunted or the flavors of what you are growing won’t be as ideal. After you remove your summer plants and before you plant your fall harvest, enrich your soil with the nutrients it needs. If you keep a compost pile, that would be perfect. 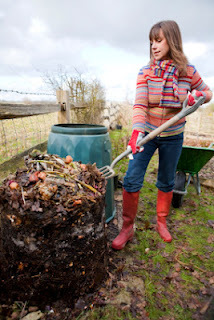 Take your compost and mix it in. Don’t be afraid to add in some blood meal, fish emulsion or seasoned manure for your nitrogen, bonemeal for your phosphorous and seaweed, wood ash or green sand for your potassium. If you are going to add these items from store bought packages, be sure to pick items that contain other valuable nutrients as well, such as magnesium, calcium and so on. But to reiterate, if you are keeping your own compost and better yet, vermicompost, then those items will give you just about everything your fall garden will need to thrive. 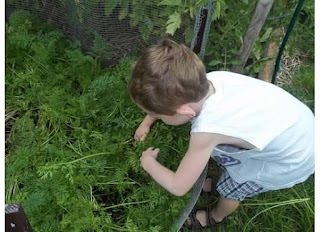 While I can not say that what I am about to tell you will make your kids devour carrots like a hungry rabbit, it should at least get them excited about growing and harvesting them. On a side note, sort of on topic, ironically, I have put some carrots out for the rabbits and they won’t eat them, only the carrot greens. The squirrels on the other hand, well, they will eat just about anything. 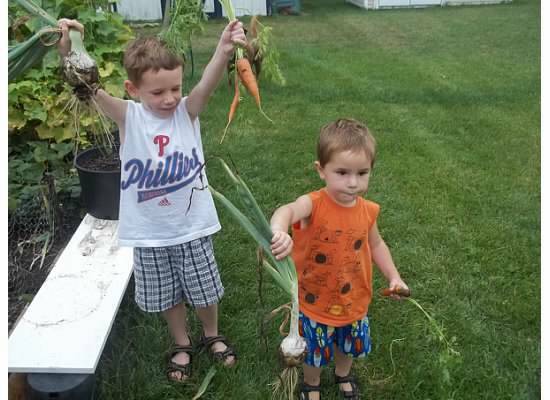 Here is how I got my two boys excited about growing carrots. I will get into a little trick my wife uses to actually get them to eat the carrots, a little bit later. I built and dedicated a four foot by four foot raised bed, made from landscaping timbers that are readily available at any home center for a few bucks, for my kids’ carrot growing adventures. There is nothing fancy about this raised bed, as you can see. It is a simple square, two layers of timbers high. Once the raised bed garden is built, you will need to add in some soil. Your options really are limitless here with any of the organic soil varieties available at garden centers, to the “create your own” methods. One thing's for sure, since carrots are a root crop you will want to have soil that is loose and friable. 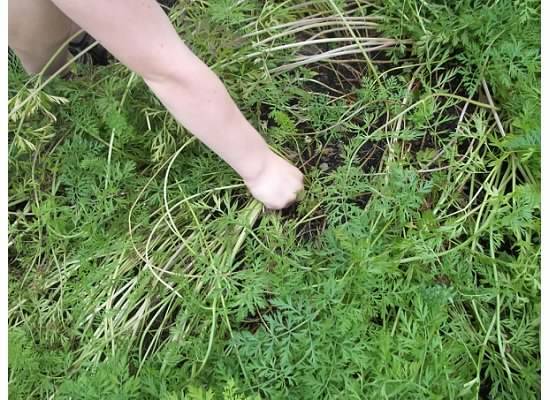 It will allow your carrots to grow more freely and give their roots a chance to spread out. Your bed is set up, you have your soil in the bed, now comes the time to plant the seeds. Two years ago I gave my sons a couple of packs of carrot seeds and told them to go ahead and have fun. While they enjoyed that very much, the bed had carrots everywhere and some too close together. Neither issue resulted in a less tasty carrot or reduced amount of fun, but we did make some changes for this year. Instead, for this year, we created rows for 5 different varieties of carrots and spread the rows apart about seven to eight inches. I had them lightly sprinkle each variety of seeds in their marked row, making sure we did not overseed any particular spot. I was keeping a close on the project (sort of). So, as you can imagine, up to this point, from working with wood, to playing with dirt, to planting seeds, they were having a ball. What kid wouldn’t like getting dirty right? Once everything was planted I would go out to the raised bed with my sons every other day or so and help them pick any weeds, making sure they understood, the raised bed, was for carrots only. My way of convincing them that weeding was a good thing. Fast forward a couple of months and the raised bed is filled with carrots. I think the big thrill for kids about carrots, or so it seemed to me by watching my sons, was the fact they could not actually see how big the carrot is until they pulled it. This also presented a slight problem because if my older son picked a carrot and it was huge, and my younger son picked one and it was smaller, my younger son would want to keep picking until he had the larger carrot. I was constantly on “do not pick too many” patrol. 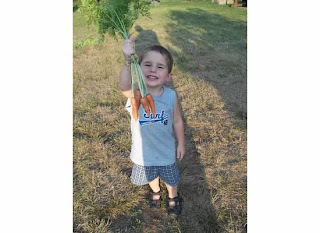 Now that they have had so much fun picking carrots, how do you get your kids to eat them? My wife likes to shred the carrots and add them to just about everything she cooks. It keeps the pieces small, and when cooked, they soften up so it makes it easier for them, I suppose. If the weather in your area of the world is anything like mine, then chances are there are many varieties of vegetables that you simply can not start from seeds directly outdoors. This is because the amount of time you would have from the moment the weather “cooperates” until the day when the weather no longer “cooperates” isn’t very long. Take for example tomatoes. Most tomato varieties require anywhere from 70 to 90 days for full maturity. There are a lot of places that do not have the 70 days, let alone the 90. So what can a vegetable gardener do to overcome this? There is one basic solution to this dilemma and that is to start your seeds indoors. Sounds like a no-brainer right? But before you just shrug off this as being common knowledge, lets take a look at what you need to do in order to maximize the chances of your indoor seeds actually being productive for the outdoors. Let’s start with the soil for your needs. There are a variety of seed starting soil mixes on the market available at any home or garden center for just a few bucks (depending on how much you buy). These work fine. What you want is a soil that is very loose and filled with nutrients. So be sure to read the package if you decide to buy a pre-made mix and read what it contains. Peat and perlite will more than likely be the two top ingredients as peat is friable and gives the soil its looseness and the perlite helps with improved aeration and better drainage. They will differ on the nutrient end of things as organic seed starters will contain compost and protein meal whereas non-organic will contain chemical combinations for the appropriate N-P-K (nitrogen - phosphorous - potassium) needs of seeds. You can always create your own seed starting mix as well, and if you have your own compost pile, I would highly recommend it since you know what your compost is made out of. Equal parts peat, perlite and compost should suffice and if you want to go even “greener”, substitute coir for peat. Coir is coconut husk and is just as friable as peat, just a bit more expensive. Next you will need something to put the soil in. Here your possibilities are endless. You can go with trays, up through plantable pots, reuse old cottage cheese containers, you name it. The choice is really yours. I find using plantable cell flats are much easier, but I also use some leftover yogurt cups, with holes drilled into the bottom for drainage, as well. Using warm water, I like to water the soil first before I put it into any pots and plant any seeds. I feel it makes it easier to work with. A bit messier, but easier to work with. Just make sure when you water the soil, you do so in a container that has plenty of drainage. You want your soil moist, not saturated. Fill your pots, cell flats or whatever it is you have chosen with the moist soil. Poke holes to the depth that is needed for the seeds you are planting, drop the seeds in and lightly cover. Your seeds will need plenty of sun and a good germination temperature. For me, I place my seed starters on or near the windows of my house that receive the sunlight first thing in the morning. This gives them the most exposure of sunlight throughout the day. For germination temperatures, I like to use a propagation dome on all my seed trays. This helps keep a constant, warm temperature for the seeds and helps not only ensure the seeds will germinate, but do so rather quickly. Once in awhile we will get lucky in our area and have a 65 to 75 degree day when the average temperature is under 50. If this happens for you, don’t be afraid to take the seeds outside and into the full sun. This practice especially comes in handy when you need to start hardening your plants off. Once your seeds germinate, you will want to keep an eye on them. When they get larger you will need to move them to bigger containers so their growth will continue, and the new soil, in its new container will have more nutrients for the young plant to take advantage of. Between last night and this morning I picked roughly 10 pounds of cucumbers. My kitchen counter was literally covered with them. My wife made it clear to me that I had planted way too many, and at the rate I am picking them, I really can not argue, but like you, I am addicted to growing fresh veggies. Besides, my neighbors enjoy them so it keeps me on their good side, espeically since I have a dog that enjoys barking a lot (at night). You can see the trade off. But, to me, what makes the production of my cucumbers even more impressive (if I must say so myself), is that it is all done in a four foot by four foot raised bed. Yes, that is only sixteen square feet of area to grow in. The raised bed itself is nothing fancy. It is simply built from landscaping timbers purchased at a local home center not too far from my house. They were on sale for $0.50 each, so I could not pass it up. 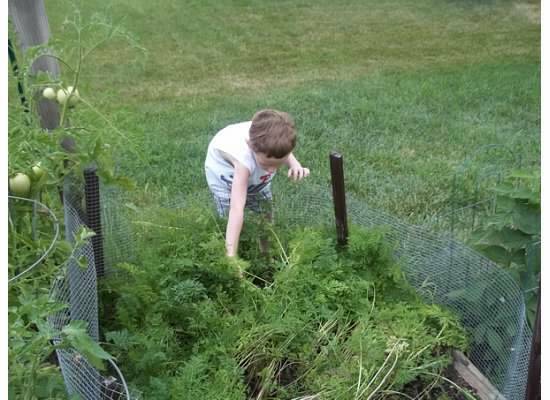 The picture to the left is a photo of my raised bed garden for the carrots I am growing. The cucumber bed is exactly the same, however, since the vines are very thick and somewhat overgrown, it was tough to get a picture of it, as you will see below. In the center of the bed I built a trellis, 6 feet tall by the width of the interior of the bed. As you can see in the photo I used nothing more than some old pine trim wood that I had left over in my garage for both the sides and top. As you can see from this photo the base of the cucumber plants are full grown so it makes it tough to snap a photo of the raised bed I mentioned earlier. You will also notice the trellis and how the vining cucumbers grow up it. Growing vertically is a great method for high production home vegetable gardening with limited space. The trellis has attached to it some netting. I would like to say I found the netting in the trash, or some thrift store, however I did not. I purchased it from a local garden center for about $5. Looking back I am sure if I were more patient I could have done better on the price. With that said, as you will see in the photo to the left, the netting is connected to the wood frame using zip ties. A friend of mine is an electrician and I "bumbed" a few off of him. You will also notice that the frame is connected with nothing more than a two deck screws (one on each side), of which I already owned from a previous home project I worked on. The frame itself is not, however, attached to the raised bed. I simply drove the sides into the ground with a hammer, before I screwed in the top brace that you see in the photo above. When the season is over, I will simply pull the trellis out, in tact, and store it away in my shed to be used next season. Here are some notes about the cucumbers being grown. They are the Ashley variety, part of the Seeds of the Month Club, and are indeterminants. I have 16, yes 16, plants growing in that four foot by four foot area. As of this posting, I have picked a little less than fifty pounds of cucumbers over the past few weeks. Looking at the cucumbers vines and how lush and green they are, I think I am on pace to break my own personal record of 200 pounds of cucumbers. Ashley's are much heavier than the straight eights I have grown in previous seasons, and taste very good, but in my opinion, not as sweet. My wife disagrees with me. I would like to say that I am doing something special, unique, or different than some other home vegetable gardener, to yield this many, but I really am not. My garden is growing in a typical New Jersey suburban neighborhood, and I know if I can grow this many, so can you. As many of you know we have an online store where we sell an excellent selection of vegetable, fruit and herb seeds. Yesterday, to go along with our seeds selection in our store, we added our newest addition to our store, Cowpots(tm). Cowpots are simply the very best seed starting pots for your plants! You have probably seen them on television, having been featured on the Discovery Channel`s popular series Dirty Jobs, on CNN, and a variety of national and local television shows. Revolutionary seed starting pot made with 100% renewable composted cow manure. They are manure-fiber based seed starter pots, which allow for unrestricted root growth creating stronger, healthier plants. These earth-friendly pots you plant are an exciting high-performing alternative to plastic and peat pots. The CowPots manufacturing process removes all weeds, pathogens and odor. All that`s left is the natural fiber and goodness of manure: the perfectly plantable seed starting pot! So as you can see we are pretty excited to add this product to our existing line of open-pollinated heirloom variety seeds. And of course, as always, Seeds of the Month Club members will receive 25% off their order and free shipping. Where do I begin with just how much better home grown broccoli tastes over store bought nameless varieties? Maybe I am a bit biased because I think everything I eat from my garden tastes better, but I am sure I am not alone with this assessment. Not only is broccoli great tasting, but very easy to grow. In fact I have been growing it at home for the better part of 10 years, and I can not remember, at any time, where I struggled growing it once. Along with its ease of growth, the many nutrients broccoli provides, makes for a great addition to anyone’s garden. Broccoli grows best in cooler weather, but you can still get great florets in warmer temperatures (more on that in a moment). I have achieved excellent results by starting my broccoli seeds indoors about eight weeks prior to the final frost in my area. During this time, if outdoor temperatures heat up during the day to above 50 degrees, I will move the plants outdoors in the full sun, to start the acclimation process. I continually add compost to my soil all fall and winter long, so I know my garden, from a pH standpoint is ready to go, but it never hurts to take a reading just in case and adjust your soil as needed. Broccoli grows best when the soil’s pH is a little below 7 (neutral), in my own experience. I have done well when I only grow a couple of plants, up through a near dozen, but one thing I have found where the broccoli really does well, and that is in a spot that receives full sun (at least 8 hours) throughout the day. Your broccoli plant will grow a large head in the center of the plant. When it is dark green, looks firm and the buds are “tight”, it is ready to be harvested. Simply use a sharp knife and cut the head off. Do not pull out the plant. 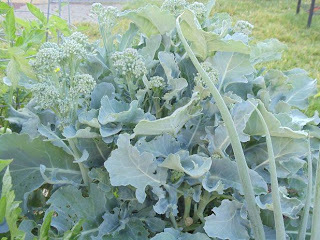 As mentioned earlier, even after the head is harvested and spring moves into summer, the plant will still produce small broccoli florets for a few more weeks. Although higher temperatures will send it to over ripen much faster, if you keep an eye on your plant, daily, you can grab plenty of extra for a lunchtime salad. I have done well in the past, planting my broccoli near onions, celery, tomatoes, peppers, carrots and eggplant. Neither the broccoli nor the neighboring plants showed any adverse effects so it seems broccoli makes for a great companion to a lot of these plants and more as some on our facebook page have noted. To be forewarned, broccoli will take up a lot of space, so if you utilize square foot gardening methods, most varieties of broccoli will take up two squares. Also, don’t be afraid to grow your broccoli in pots, containers or raised beds. It is the perfect plant for all of the above. They are very low maintenance. Just another reason why they should be part of your garden.